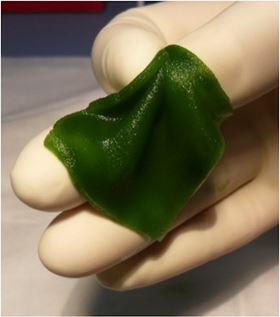 Photo of the photosynthetic biomaterial known as ‘HULK’ from the German for Hyperoxie Unter Licht Konditionierung. Oxygen is needed in every stage of wound healing and tissue repair. But despite advances in artificial scaffolds that guide cell regrowth after injury, supplying new tissue with oxygen and other nutrients remains a challenge. Now researchers have come up with a novel way to supply regrowing tissue with oxygen using algae. The body’s vascular network of capillaries supplies oxygen to tissues and organs. But if that network is damaged, tissue can become deprived of oxygen – known as ‘hypoxia’. So researchers from Technische Universität München and Ludwig-Maximilians-Universität in Germany and Universidad de Chile looked to the original source of oxygen for living organisms – photosynthesis – for a solution [Schenck, T.L., et al., Acta Biomaterialia (2015), http://dx.doi.org/10.1016/j.actbio.2014.12.012]. The team loaded artificial collagen-based tissue scaffolds with the single-cell photosynthetic alga, Chlamydomonas reinhardtii, which can be found in soil and water around the world and is widely used as a model system in biological studies. The photosynthetic biomaterial generates oxygen when exposed to light and is biocompatible in vitro. “Photosynthetic biomaterials offer an unlimited source of oxygen which can be regulated according to the tissue needs by modulating the intensity of light applied,” continues Egaña. The next step was to try out the photosynthetic biomaterials in vivo, which the researchers did using mice. Samples of the photosynthetic biomaterial were grafted onto the skin of mice and monitored for five days. Surprisingly, the researchers found that the algae did not trigger an immune response and survived for the duration of the trial. In fact, the photosynthetic biomaterial formed a kind of partly plant, partly animal chimeric tissue. Such an outcome, although rare, is not unknown in nature, points out Egaña, where plant-animal symbiotic relationships are sometimes established to supply the animal host with oxygen and energy. The researchers believe that these unique photosynthetic biomaterials could represent an innovative way to supply thick tissue engineering grafts with oxygen and minimize the problems associated with a lack of vascularization in general.